Oakland Raiders destroy Denver Broncos 2010 NFL Picks , NFL Scores & 2010 NFL Predictions - There was a time, not so long ago, when this game meant something outside the Bay Area and the Rockies, when this game meant the Orange Crush defense vs. the Snake, John Elway vs. Howie Long, Mike Shanahan vs. Jon Gruden. Now, the match-up in week 7 2010 NFL Picks of the NFL schedule means survival in the AFC West as the Denver Broncos (2-4) host the Oakland Raiders (2-4). Vegas Lives & Vegas Point Spreads have placed the Broncos as -8 1/2 point favorites at home. Recently, the two teams have played evenly, with the teams splitting their season NFL Predictions series every year since 2006. Denver is coming off two disappointing losses to the Jets and Ravens and are just 1-2 at home, a place that used to give Denver a huge advantage. The Broncos the third best passing offense but seemingly have abandoned the run. Kyle Orton has completed 62.8% of his passes, with 9 TDs against 3 INTs. Three receivers have caught over 30 catches, including 37 by Jabar Gaffney and 34 by Brandon Lloyd. Lloyd leads the team with a whopping 663 passing yards and a 19.5 average yards per catch. Defensively, Denver has played well against the pass but are still a soft team against the run, something the Raiders can exploit. Bet on Monday Night Football and receive 25% Sign Up Bonus tonight Giants vs Cowboys Sign Up Here. 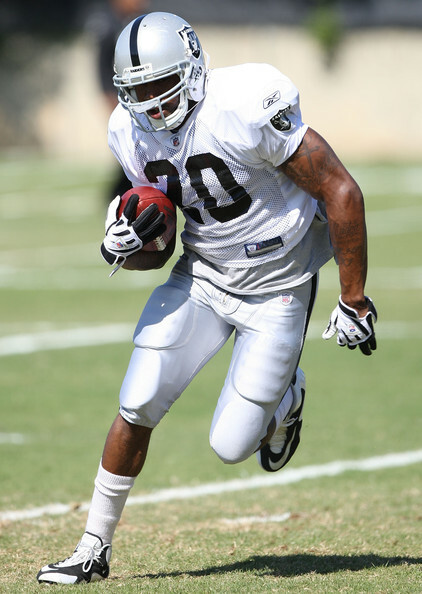 The Raiders have been able to establish the run this year with Darren McFadden and Michael Bush, and McFadden should be available this week. The problem on the offensive side of the ball has been at quarterback. Neither Bruce Gradkowski nor Jason Campbell has particularly distinguished themselves in 2010, throwing for a combined 6 TDs and 8 INTs. Even punter Shane Lechler took some snaps under center this week, but Campbell should get the start. On defense, the Raiders have played solid in the passing game but have been run upon all season (which should not be a factor in this game). The Raiders should keep the score close since they can defend the pass well and run the ball. Oakland should cover the Vegas spread but the Broncos will pull out the win. 2010 NFL Picks , NFL Scores & 2010 NFL Predictions Bet on Oakland Raiders Plus the points. NFL Scores Darren McFadden shredded the Denver defense for 3 TDs as the Oakland handed the Broncos a 59-14 defeat on Sunday at INVESCO Field at Mile High. Next 2010 NFL Picks game, Oakland takes its act home to face Seattle looking for another win. For Denver, they head on the road to face San Francisco.